Many people have dreamt of having blue eyes and blond hair or to have their dark green eyes tinted to a lighter shade. Until recently, coloured contact lenses offered the only alternative to people wishing to change the colour of their eyes, today however with the help of eye colour surgery people can have their eye colour changed and that blue eye, blond hair look is no longer beyond reach. What is Eye Colour Surgery? Eye colour surgery is a safe and effective permanent eye colour change that is carried out under local anaesthesia. Results are immediate and no one who looks a person’s eyes can tell they are not their own natural colours. 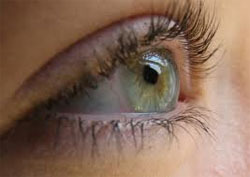 The iris is situated in the eye at the back of the eye. Eye colour surgery places a coloured diaphragm over the iris to change its colour. Unlike coloured contact lenses, the diaphragm can stay in place even when swimming or engaging in other water sports. The surgery has implications for patients who for other reasons need an iris implant. Birth defects and trauma to the iris are possible reasons that people may seek the procedure other than for cosmetic appearance. The person seeking the implant typically attends the clinic or treatment of an ophthalmologist who is trained in the procedure. Local anaesthetic is applied to the eye and then the diaphragm is carefully placed over the surface of the iris. The procedure is similar to the one that is done for those people who have cataracts removed and is considered a safe procedure for most people with no other pre-existing medical conditions. The procedure is painless and recovery is quick, although the patient may experience some blurred vision for 2-4 days and must remain near the clinic until vision is completely restored. During this period, mediations such as antibiotics and eye drops are prescribed to assist in the post-operative recovery. The procedure is currently only available in Panama and was developed to assist people who were born with albinism (typically without pigmentation in their skin or their eyes). There were some early documented cases of post procedure problems that were reversed, however the procedure has had no reports of problems in recent years. People are screened for other pre-existing health conditions prior to surgery and to check their eligibility for the eye colour surgery procedure. Because of travel requirements people from the UK will need to budget for flight costs and accommodation costs as well as the procedures and it could cost as much as almost £8,000 to have the procedure performed. This would not be covered by NHS and would require a private consultation. The product is made by NewColorIRs in the USA but is only performed in Panama. Typically the clinic requires a patient to remain in the area for approximately one week until vision returns to normal and this week’s accommodation, usually in a hotel, is part of the overall cost.